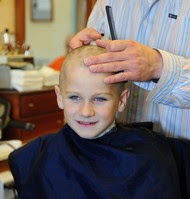 Colin Middlebrook, a Frederick first-grader, shaved his head recently in support of his 4-year-old cousin, Henry Scheck of Hagerstown, who has cancer. Colin Middlebrook got a Baltimore Ravens hat for Christmas. And he'll be sure to wear it as the weather turns cold, since his hair isn't there to keep him warm. Colin, a first-grader at Spring Ridge Elementary School, told his barber to take it all off last week in support of his cousin, 4-year-old Henry Scheck of Hagerstown. Henry was diagnosed with brain cancer in October, and he's lost most of his hair in two rounds of chemotherapy. The haircut was all Colin's idea, his parents said. 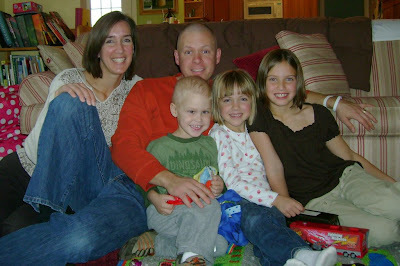 He'd wanted to shave his head before seeing Henry at Christmas, but John and Lisa Middlebrook said no. "He kept asking, and I don't know what made me change my mind," said John Middlebrook, Henry's uncle. Patrons at Gentlemen's Choice II barber shop in Frederick on Thursday said they admired Colin's idea and that his cousin would be proud, and relatives from across the country said the same, John said. "People all over the place thought he was a pretty big kid to do that," he said. "And Henry's mom and dad thought it was cool." Henry has seen the pictures of Colin's new 'do, and the cousins might see each other New Year's Day, the Middlebrooks said. However, Henry is getting ready to start a third round of chemotherapy and can't have many visitors. Colin said a shaved head feels a lot different, but he likes his hair short. He didn't tell any of his friends or teachers about his haircut plans, so many of them will be surprised when he returns to school next week. "He doesn't think anyone at school will recognize him," John said. Henry's family has started a blog about his battle with cancer. They're also selling white bracelets, inscribed with "Life is Fragile, Love is Not" as reminders of Henry's challenge. The $2 donation for each bracelet will benefit Francisco, a boy from Brazil who is sponsored through World Vision, a Christian relief organization. The sale was organized by the Glade United Church of Christ in Walkersville, and more than 200 have been sold so far, according to the site. The last couple of days have been relatively care free. We made a trip down to Johns Hopkins on the 26th to have Henry's blood drawn and to clear his catheter which had gotten plugged. It turned out to be uneventful and we were home by dinner time. The results of his blood counts told us that his platelet levels would keep us from starting round 3 until at least New Year's Eve. We've opted to start on Thursday, January 3rd which will give us time to spend with my brother's family visiting from Kansas and my Mom and Dad who are returning Sunday. Yesterday, we had our own version of the hospital here at the Scheck house. Sophie had strep throat and so had to be quarantined upstairs all day away from Henry. She handled it well, watching TV, making crafts and playing video games. By the end of the day I felt like I'd been to the gym doing the Stairmaster. After 24 hours of medicine she is no longer contagious so she and Henry are playing a lot together already today. Tonight the girls are visiting a friend overnight and Tara's mom, Jane is taking Henry for a while so Tara and I can have a dinner out. Today will be spent running errands and just being together. Despite being sandwiched between hospital days, we had a lovely Christmas Day. The morning was busy with presents and setting up new toys and digging for batteries. Anna, Sophie and Henry all had an abundant Christmas with toys and games from friends and family. We were still reeling from a visit with Santa Claus the night prior. After some down time in the afternoon we headed over to Uncle John and Aunt Lisa's house for Christmas with Tara's family. Henry got to spend time with his boy cousins and the kids opened additional gifts. The adults visited while nibbling at terrific finger food followed by an equally wonderful turkey dinner. The kids all played video games, ran around outside and raced cars along the floor. Henry had an especially nice time with Cousin Charley. 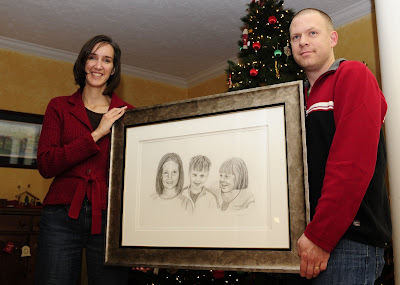 After dinner we were presented with something we couldn't ever have expected - a amazing portrait of our three children done by an artist friend of the family. We were then told that it was commissioned by dozens of our family and friends around the country. It is at times like this that words fail me. The phrase 'thank you' simply cannot capture the appreciation we have for the obvious love and support this represents. The portrait was accompanied by Christmas notes and statements of encouragement and love, all of which we've yet to even go through. We're so grateful to each of you who've provided the energy and love to keep us going. So Henry was up early this morning, 4:30am. I guess he's just happy to be home. Since Tara was going to work this morning, I got up with him. We watched TV and he asked for macaroni and cheese. I went upstairs to shower around 6:45am and asked Tara to feel my pulse. My heart had been pounding in my chest for most of the morning. It turned out that my pulse was irregular and she asked me to follow her into work for an EKG. A quick test revealed that I was in atrial fibrillation. My heart was receiving unusual signals which caused it to beat differently. Tara's doctor friend, Matt Hahn, called in a favor with a local cardiology office in order to keep me out of the hospital at Christmas. After a morning of three EKG's, two doctor's offices and an echo cardiogram (...in a pear tree) I was sent home with orders for an aspirin a day, some blood work and an appointment for a stress test. It seems that atrial fibrillation can be stress induced but that I may have minor irregularities that may have contributed as well. I'll have some additional tests during Henry's next hospital stay. So now we're ALL finally at home with plenty of reasons to celebrate. We have some much gratitude in our hearts for each of you who continually pour love and support upon us in abundance. Happy Holidays to you and your families. Give extra hugs and kisses to all of the children in your lives. They are precious and cannot be taken for granted. Know we send special holiday wishes to all of you. Henry and I will be leaving the hospital today to join Bryan and the girls at home. The holiday timing really couldn't be better. Since his counts have recovered, he no longer needs to be sequestered, so we'll get to see our germy snotty cousins (sorry, boys, but you know it's the truth) on Christmas day. When I changed Henry this morning I noticed a lot of bruising on his knees. The nurse confirmed my suspicions that his platelets are down, to 10 this morning which is the lowest he's been thus far. We'll need a tank-up before we get discharged, but then he should be in good shape for the next few days. So we didn't get the news we wanted to this morning. Henry's ANC isn't over 200; at 126, we're figuring we're at least there till tomorrow, though we still plan to request a recheck for later today. He's still feeling great, and being very active. Keep your fingers crossed that we'll be out soon! Today was a very busy day for our little Henry. He was feeling great and because he was drinking well, he was 'free' from the IV pole. He had to be hooked up only a couple of times for short duration for some antibiotics - but only if the nurse could catch up with us. Henry has learned to exploit any bit of freedom he receives in the hospital and while not afraid to venture out with the pole, without the pole he is downright difficult to keep up with. A welcome change to be sure. We traveled the entire range of what we know of the hospital today, visiting the library, the lobby, and the oncology floor and spent a large part of our day in the PCRU playroom. He insisted on bringing his new Lightning McQueen suitcase everywhere and between that and his slippers, he generated a load of smiles. We had our run of all the toys and had them spread over the entire floor. We entertained the clowns again and danced to a singing bus. He ate puffy cheetos (cheese puffs) and pretzels, drank apple juice and fruit punch, and chased the nurses. He fell asleep easily at the end of the day and is resting peacefully next to me as I write this. The nurse will draw blood in the middle of the night, it will be tested and provided the ANC (Absolute Neutrophil Count) is higher than 200 and he has no signs of infection, we're headed home tomorrow. If his ANC isn't quite high enough, we'll have to talk the staff into testing him again a little later versus waiting 24 hours. Either way, its looking good for Christmas. And best of all, he's feeling great. Yesterday afternoon, after regularly finding a normal temperature for days, Henry registered a fever. 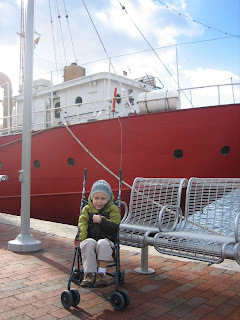 A quick call to the Oncologist in Baltimore confirmed what we knew we'd need to do, back to the hospital. Because he was acting normally with no signs of delirium, vomiting or drowsiness, they recommended that we drive directly to the Hopkins Emergency Department. Two hours later we were pulling into Johns Hopkins ER and spent the remainder of the afternoon and early evening there. We were fortunate enough to receive care from a very caring, former Oncology nurse there who was familiar with our needs as well as the staff that normally cares for Henry. We were transfered to the third floor this time as our normal floor, eight, was full. This floor is called the Pediatric Clinical Research Unit (PCRU). This is reserved for children on protocols that require monitoring and careful documentation, etc. It is comfortable, but unfamiliar, so we'll acclimate over the next 24 hours to a slightly different environment and routine. In the spirit of being thankful for small things, the adult bed is more comfortable, albeit smaller. So we had an OK night. Henry slept well once asleep but woke early to a painful tummy ache. After several bowel movements over the course of an hour, he told me "my tummy feels much better". We talked to Grandma Linda and Mommy on the phone, ate some breakfast and we're now watching what seems to be his new favorite movie, "Firehouse Dog". Which I'd recommend to anyone with young boys. Firetrucks and dogs in the same movie? Come on, that just can't really be beat. I find my mood in the hospital to be improved. I guess in some way I feel like we're doing something. The onus of attending to a potential fever and the anxiety of it descending at any time has passed for now. The best part now is actually that his temperature has come down again, again, so different than the last time. I checked with the nurse and his counts seem to be bouncing back already now too. We may actually be able to be home on Christmas after all. Finally - Henry is in a good mood and has enjoyed talking on the phone. If you'd like to call please do so between 10am and 6pm EST. Henry likes answering but he takes a minute, so be patient. Also, if its a bad time please don't take offense as we'll either not answer or let you know to try later. Our number for room 316 is 410.502.4127. Monday's clinic visit went without incident. Our appointment wasn't until 2:00p but we've come to realize they will bring us back almost immediately upon our arrival, so we came a bit early with hopes of leaving before 5pm. They draw blood and do vital signs (blood pressure, temperature, weight, height) to which Henry is finally becoming accustomed. The meeting with the Oncologist defined a couple of dates for our next cycle. The MRI has been finally scheduled, but not as early as expected. The MRI will be on Friday, January 11. Additionally, as Henry is doing quite well, they expect to admit us to the hospital again the day after Christmas. Henry's counts from his blood came back and were fine with the exception of his platelets. He received a transfusion which took about 30 minutes. We had to wait for a little over 2 hours for the platelets to come though. We decided that Henry needed to learn to complain like in a restaurant - "Hey, I ordered platelets over an hour ago, what gives? There'll be no tip for that nurse..." Really though we all handled it with patience, especially Henry. He began coughing a little upon finishing the transfusion and there was a bit of worry regarding a reaction, but the critical time passed without further symptoms and we were released about 6:15pm. Yesterday we spent at home. I feel like I spend most of the day in a daze. I still can't figure out if its being tired or what. I feel a little more on top of things today. As I was running yesterday I thought more about hope and fear. I realized that there's no way not to be afraid right now. Then it occurred to me that perhaps I don't really have to choose between hope or fear. Part of being present here and now is being open enough to allow it all to be part of me. Being anxious or calm, afraid or hopeful, angry or peaceful, selfish or caring is all part of being human. So is being open to what today, or tomorrow for that matter, has to offer and accepting it, whether we like it or not. There is a distinctly different sound when the shower water hits a shaved head rather than one with hair. I took notice of it for the first time this morning - it sounds like muted static. I've spent the last few days trying to sort out my feelings. Why do I feel so dour even when things are going well? I found it easier to laugh when we had small breaks during really difficult times, than to be constantly reminded of our reality during easy times. It's almost as if there's time to be sad. Anyway, the neutral static was welcome. These last few days have been really good for Henry. He's played and been happy. He's begun to take his medicines easily so really there are no struggles right now for him. I've noticed though a tightening around my heart though that will not leave me. I've tried my normal mood elevators - running, resting, a good soccer game on TV, a good nights sleep. There's a level of unease that is omnipresent. Its begun to make me irritable. I've had greater difficulty sleeping. It will not leave me. Henry's MRI is pending just before New Year's. This will tell us how the chemotherapy is working so far. If the cancer is responding, then we commence with the high-dose chemotherapy. While we're not looking forward to it, the alternative is unthinkable. I've been reticent to hope. Not because I have a pessimistic outlook on things, but because to hope is to not be present here and now. To hope is to be looking to the future of what might be, instead of what is. Implicit in hope is the aversion to the negative outcome as you wish for the positive one. Hope's accomplice is fear. After two days of struggling with Henry to take his medicines, he's begun to take them like he wants them. We've been obliged to hold him down and coax the medicine into his mouth by holding his nose and sometimes double dosing with as much as ended up on our clothes or the floor. This usually took two adults and involved 10 minutes of screaming. The really good news is that this is the hardest part of the last couple of days. He's been energetic and in a great mood. We've been enjoying the weekend around the house, venturing out into the holiday craziness only in spurts. For now we're content to rest for another home day free of medicinal battles. How different this cycle of chemotherapy has been for Henry. I recall how difficult the first trip to the Outpatient Oncology Clinic was. He threw up at the side of the road due to nausea - now he ate snacks all the way home. We had a bag full of medicines the first time - this time there were no medicines on board. The first time he lay in a hospital bed while I applied lotion to a horrible rash - this time he played with other kids in the playroom during his blood transfusion and rode the IV pole to the bathroom. The last time he cried all day asking when we were going home - this time at the end of the day he said, "that was quick and easy!" So while his counts are dropping, he's energetic and happy. He's going to the bathroom without anything but a small bit of preventive laxative, but no other medicines. OK - so he's got a new antibiotic today, but small potatoes (he's got a bit of an infection from his catheter). We still have to do G-CSF in the evenings, but that's all of 20 minutes. This time has definitely been less stressful. We now have three days at home and back to clinic on Monday. We're leery of a possible fever from infection, but we're cautiously hoping for smooth sailing through Christmas. One of the realities of the hospital is that nothing happens on time. We did however make it home tonight, albeit late. We arrived home around 8:30pm. 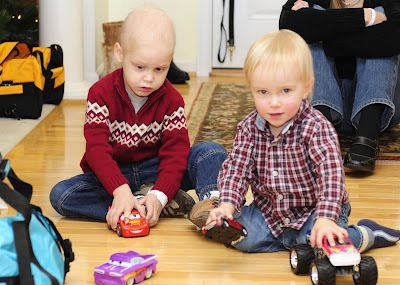 We'd spent the afternoon playing and racing with new friends through halls of the Oncology floor. We met a 5 year old boy with aplastic anemia awaiting a bone marrow transplant and a 3 year old little boy with acute lymphocytic leukemia. Perhaps we'll run into them again at future visits. Henry had great fun racing in the halls and arrived home in similar spirits. He played with his sisters for a few moments before bed and all were happy. Tomorrow is Sophie's birthday. We're thankful to be home to spend that special day together. Thankful too that Henry is in a good mood, eating and drinking and generally happy. His blood counts will continue to drop over the coming week to 10 days while we carefully watch for a fever. This will likely take its toll on his energy level, but he's surprised us about so many things this cycle. Our next clinic visit will be Thursday to check his blood counts and give him a blood transfusion to help him get through the weekend. Tara and I are just so pleased that he is acting so normally now we're beside ourselves. Our stress levels are directly related to his mood and how he's feeling. Tomorrow we'll also begin the G-CSF again to stimulate blood cell growth. He's still on nausea and constipation medications and seemingly the right doses. We didn't have one vomiting spell in the hospital at all! We should be going home today as planned. After speaking with the Oncologist, we decided last night to 'refuse' the steroid Henry has been on in favor of sleep over nausea control. It seemed a good gamble and has paid off. Its 7:30 am and he's been down since 11pm last night. His last drug is finishing, Cisplatin. He then has 8 hours of fluid to clear that out. Better rest was good for everyone. Last night as he was winding down, he said, "Daddy, I was thinking about griving my cruck." He's definitely looking forward to going home. This cycle was so much easier than the first. The worst thing for Henry was taking his oral constipation medicine. The worst thing for Tara and I was the lack of sleep and the mood that ensued. So all and all a 'good' chemotherapy cycle - so far. We'll hope for no fever and smooth sailing until after Christmas. It will be nice to all be at home for Sophie's birthday tomorrow too. Yesterday as I was waiting out the bandage change in the parent's lounge (it was my turn to play the 'can you handle this one?' card) a woman was telling me her story of their recent admittance to the hospital of her grand daughter with acute leukemia. I've become pretty good at listening to these stories without getting too worked up. There are just so many of them. This time though, the similarities were enough that her story gave me vivid reminders of some of the whirlwind that we'd been through initially. It was tough to see them and know of their heartbreak at this moment and it grounded me in our reality again. It's amazing what we can acclimate to. One thing hanging over our heads right now will be the head and spine MRI which we presume will be done just before the third cycle begins to determine the effectiveness of the treatments to date. While we're not looking forward to the high-dose chemotherapy (cycles 4-6), as its very hard on the children who receive it, it is a necessary treatment if we want the best chance of long-term survival. The MRI will determine if the current chemotherapy is making sufficient headway to proceed. For now, we'll pack up our stuff in the hospital and play the waiting game which is discharge. That's a game definitely worth playing! Good news today! We're being discharged tomorrow, probably late afternoon. It's a day earlier than we expected, so we're very excited. Henry has done so much better this cycle. Granted, we're not the ones experiencing the chemotherapy, but by looking at his general level of discomfort, this week has been so much better than the first round. We expect him to continue to feel poorly for the next several days, but feel more confident about our ability to recognize things that can help him feel better. Most importantly, if he's not eating we can restart his TPN (IV nutrition). We're keeping our fingers crossed that it will be a quiet couple of weeks and we can avoid another hospitalization until chemo round 3 begins. Henry gets them to help with the nausea side effects of his chemo. And where last cycle he didn't eat at all on Day A (which was today), today he nibbled a bit, until dinner. Then he ate like I haven't seen him eat since the last time he was on steroids (directly after his surgery). He downed at least a cup of spaghetti with sauce, and ate a bit of ice cream after. He's already asking for more spaghetti for breakfast, this time with a side of pizza. Steroids really boost the appetite. They also jack you up, which was why he didn't sleep for Bryan last night (note my optimism, I haven't yet conceded tonight). And probably why he was so irrational today. It was like having a particularly angry two year old. Every 2 minutes he found something to argue over, and argue he did. Then he screamed. Then he hit and kicked. And it pretty much lasted the two minutes till there was something new to be ticked about. So I'm glad the steroids are working. But wow, the steroids are working. After another very active day, last evening (as in 4 hours ago) Henry began his Etoposide and Cyclophosphamide. These each take approximately one hour to administer followed by the nurse flushing the IV. He is now receiving his Mesna, chemical to counter the effects of Cyclophosphomide which can cause bladder inflammation and lead to hemorrhaging. Well - believe it or not, as I'm writing this he's quiet and now sleeping. I had tried from about 8-10 to put him to sleep and then gave up. He's been up and active since then. Perhaps I should have written earlier!? Henry had a great day yesterday. We played endlessly with a dollhouse that included a mailbox and a mailman. Henry cut up paper into millions of microscopic pieces that we "mailed" to the various dolls around. It really occupied him, and as long as he was keeping the scissors far from his IV lines I was able to relax too. Don't think I didn't imagine how I'd have to explain that one to the nurse. We had a small issue with his Hickman catheter (central line into his chest) migrating out a little bit. A chest Xray showed that placement was still good, and it sounds like it's not a big deal, just another thing to watch. Most importantly, we are monitoring closely for Utz Honey BBQ potato chip toxicity, due to the fact that Henry ate 5 full bags yesterday. For those counting, each bag is 230 calories, so between the chips and the drinks he took in, I'm guessing we hit 1400 calories yesterday. I was thrilled. He's already downed a bag and a half today. The above line is Henry's contribution to the post today. He's found the H button on the keyboard. His methotrexate level has dropped low enough to begin the second half of chemo. I anticipate he'll begin feeling poorly once it starts if it mirrors our first cycle. Hopefully, the lows won't be as low. I think a lot of his misery the first time around was anxiety at being in the hospital and all of the stresses associated with that. He's taking all of that in stride this trip. Bryan is on his way down this morning to stay for the night. 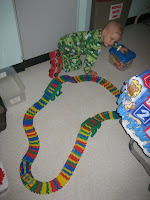 Henry is excited to show him the train that is being set up in the lobby - I think we'll be making many trips to go see it. Spontaneously this morning, Henry said, "Yesterday at the soccer field, I fell over and couldn't stand up." 'Yesterday' and 'Tomorrow' are his 3-year old synonyms for past and future times. I was curious to see what he remembered and asked him what Mommy and Daddy did then. "You took me to the doctor," came the reply. I decided that this was an opportunity to explain a bit about his cancer. I told him that there was a ball in his head the doctors had to take out and then he could walk again. I formed my thumb and index finger into a quarter sized circle. I told him that some of the ball came off and went to his head and back and that is why we were giving him medicine that 'eats' the pieces of the ball. "How does the medicine eat the pieces?" I told him that I didn't really know, but the doctors were taking care of it and that the medicine kept the pieces from getting bigger and took them out of him in his pee. (OK - so maybe not a perfect analogy...) He replied, "and the food makes me poop." That got a smile out of me. "How does the ball make me not walk?" Wow. I felt like we were verging on Biology 101 now. I picked up one of his nearby stuffed animals, told him where his brain was , that it helped him do all sorts of things like talk and eat, and told him the ball was pushing on the part that helps him walk. "Can I watch Curious George now?" Got it. That must have been enough. I just love his mental acuity. If he holds to form, I imagine this conversation will resurface more than once and will be completely intact. He just needs some time to process. While the kids at home played in the snow, Henry and I (Tara here) had a great day here in the hospital. 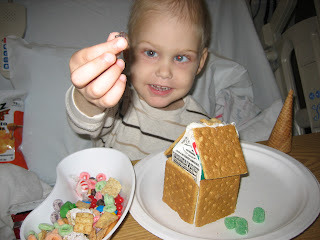 To start with, the Child Life department at the hospital hosted a make-your-own gingerbread house. Each kid got their own fixin's, in the (maskless) comfort of our rooms, but we watched on the inhouse hospital channel how to do it in real time. It's a neat system, you can call them up on the phone and ask questions or give ideas...it's like a virtual, germ-free playgroup. 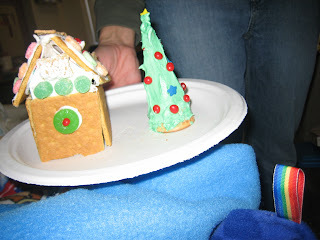 Anyway, we did pretty well, as you can tell by the pictures. Henry took great delight in my sticky icing fingers. 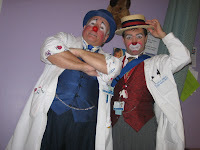 We also got a visit from Dr. Boots and Dr. Spats, who run the CCU here at Hopkins - that's the Clown Care Unit. Henry took great delight in hiding under his blanket before they came in, and as highly trained professionals, they ran with it. They had him laughing out loud, and we hope to see them again soon. We also took several trips around the hospital. Henry really enjoys getting off the floor, and as long as he keeps his mask on we have been allowed to travel away. We hit 2 restaurants and the coffee shop, as well as watching the constructions workers search for things under the light cover of snow. All in all, it's been a great day. His spirits are good, he's accepting of being here, and he seems to be making the most of a less than ideal situation. 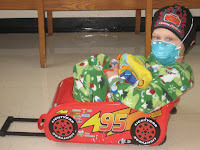 Henry's second round of chemotherapy medicines began yesterday. We started again with Methotrexate and Vincristine. The doctors have decided to administer only half of the Vincristine this time due to the constipation complications that Henry endured last cycle. We've been assured that this will not compromise his outcome. These drugs work in tandem with one another and the doses are based only on weight and height so some individual tweaking is expected. Henry and Tara slept well last night which was a relief to everyone. Anna and Sophie do not have school today and are currently out helping our generous neighborhood children in clearing the driveway of the cause. I suspect some hot chocolate and indoor playtime will be in order later to warm them up. I'm enjoying a quiet day of cleanup, laundry and organizing holiday details. Its nice to be busy with those things but I find myself easily distracted and daydreaming a bit - just phasing out and kind of forgetting what I'm supposed to be doing. There is a rhythm in the hospital. There are things that need to be tended to and now without those immediate demands, its so easy to become lost in thoughts. Later today we plan on taking a trip to Baltimore to visit Henry. I had the girls wear masks for a while today to make sure that they can tolerate it if need be. Sophie is coughing a lot so I'm thinking they'll be a needed precaution. We'll decorate Henry's room and just let them be together for a while. It will be good for them to see where he is and meet some of the people that help to take care of their brother. Henry's pheresis yesterday went as planned. The procedure of removing and separating his stem cells began early with the placement of a special line in his groin area. For this a special team of two nurses spent an attentive day at a large machine which withdrew his blood, separated it, then replaced it, warmed, into his body. He was under heavy sedation all day which also meant he was on a ventilator throughout. This was to ensure that he did not move during the procedure as it would hamper the results. I spent my day mostly with logistics - moving our stuff from the car, checking out of The Children's House, moving the car - and with some catch up sleep, which while not completely restful in the chairs in the P-ICU (Pediatric Intensive Care Unit) was better than nothing and got me through the day. I also visited with some of the other families there and got a rare window into their lives. One woman's daughter was recovering from toxic shock. Another family from North Carolina was in for their daughter's 18th surgery for brittle bone disease. A two-year-old little Chinese boy next to us was awaiting surgery for a heart defect which prevents his blood from oxygenating his lungs sufficiently. His adoptive mother had just brought him back from China less than a week ago. He'd been abandoned due to his condition and had been in an orphanage since very early. His new family had adopted him fully aware of his condition and has likely saved his life in doing so. This was their 3rd special needs adoption. The different conditions we've learned about and had exposure to, including our own, have been random diseases, handed to us by fate. Families are forced to adjust their 'normal' to accommodate their new realities. For them, and us, there is no alternative. The family of the Chinese boy had chosen their situation, deliberately, with full knowledge. I spoke to the mother at some length and they see their choices as their normal and simply what they are supposed to do. To me, I see a nobility and self-sacrifice that I'm humbled by. It makes me feel honored to have met them, I hope for the best for the little boy's surgery, and am especially reverent of the capacity of human love. Because Henry is here a bit early for his next round of chemotherapy, he has no medicine attached and his counts are good. We're free to move around the hospital with relative ease. This morning, instead of the wagon, he chose a small car with a push handle for me navigate. We went all over the hospital. He honked and waved at the nurses and shop owners. 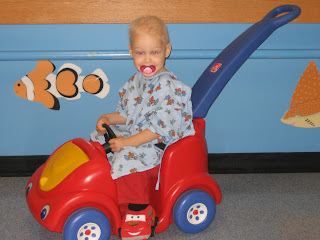 We put his purchased snacks in his 'trunk' and giggled when I purposely crashed into things or chased after the nurses. He's already asking to go home. I told him that we have to stay for a long time again. He asked, "Will friends visit me?" - a call to his Grandmothers to come again. He's becoming very accepting in some ways, defiant in others. I like to see the fight in him, but some acceptance is good too. Henry and I dawdled today. We took our time getting ready to leave the house and we made our way into Baltimore with no particular time frame in mind. I took pleasure in watching the fall leaves being blown furiously around by the wind and the sometimes-gray, sometimes-sunny sky that resulted from the gusts. We checked into the Children's House and picked up passes to the Aquarium and once we arrived in the Harbor, ate lunch and then proceeded on our own version of 'Finding Nemo'. On the way we saw the Dolphin show and caught a shortened version of the 'Polar Express' with special effects. I made sure we detoured to catch sight of a shark and a stingray and then finally found the anemones where both Nemo and Dory live. Mission accomplished - he was ready to go. Really, what more was there for a 3-year old? We had the tactical business of having to stop by the clinic for a blood draw and of running his last dose of GCSF before bed, but these were trivia. We returned after our clinic visit to a meal of pizza and salad, once again a gift from the Children's House. Henry explored the basement full of toys for a while and then setteled down for a movie, for which he lasted all of 20 minutes. He was asleep on my chest. When the kids lose their teeth the tooth fairy comes, but who comes when your kid loses his hair? Well, before round 2, we decided to summon the Hair Fairy. Henry awoke to a new book and two dollars, which was mostly for something to put in his new Lightning McQueen wallet. The book was 'Clifford's Day with Dad'. Seemed fitting that we're headed to the Aquarium for a day together. That Hair Fairy sure is something. Today was a gift. I'm starting to feel like that more and more. Today, though, despite being a little worn down from yesterday, we all relaxed more than we have in a long time. We had more visitors today, some from out of town with words of consolation, others from close by with company, distraction and food. A fire burned in the fireplace while we allowed the kids a few early Christmas gifts as we're not sure what the official holiday will bring. I've become fond of candles over the last year and lit several around the living room. There was a warm glow over the entire day. Tomorrow I'm taking Henry to Baltimore. We're going early to visit the National Aquarium. The girls visited recently and enjoyed it. I figured it was the least we could do for Henry before subjecting him to round two of chemotherapy. He's looking forward to seeing all the sharks, stingrays, and dolphins. We visit the clinic sometime before 5pm to have them type his blood for Tuesday's surgery and stem cell harvest. Then we're off to spend the night in the Children's House again. What a wonderful resource that has become for us. True to his current trajectory, Henry had his best day at the hospital yet yesterday. The most difficult part was getting his weight. It was the first thing that had us do and he was just not going to take his coat off. 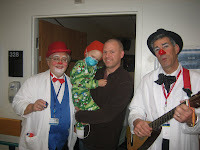 After that though, he played in the playroom they have at the Oncology clinic while he received his dose of G-CSF. We've given this to him before, but it was only over the course of 20 minutes. Now they believe that a longer exposure over 2 hours will have greater efficacy. So we sat and watched Dora and he pretended to talk on the phone to Mommy and his sisters. Altogether a very easy, gentle day for all involved. In fact, something I never thought would happen, Henry waved and smiled at the Oncologist and nurse today. He continues to surprise us with his adaptation to the extremes of his situation. This morning the home nurse came to instruct us on how to administer the G-CSF at home. Its clear why the home nursing is an industry. The room stays are by far, the majority of the cost when we see the itemizations from the hospital and insurance company. Despite the thousands of dollars of equipment they lend us and the nursing visits, it is clearly more cost effective - not to mention more comfortable and humane. Henry calls this time "being 'hooked'", like 'hooked' to his 'tubes'. He seems to prefer sitting when he's hooked, but today he was more mobile. We put his medicine pump in a dog backpack that was given him recently to hide it and make it more portable. We only hide it to keep him from having to remember what's going on. He doesn't really seem bothered by it all that much. He played on the floor for a while with a toy bus and a play kitchen mixer; he walks to the bathroom with some help and also aided Mommy in wrapping presents. I'm not sure if its easier or harder awaiting chemotherapy this time. To a large degree we know what to expect. Repeating what we've done isn't pleasant to consider, but I suppose its slightly better than not knowing. Looming large is the end of this cycle at which we will have an MRI of Henry's brain and spine to see how receptive the cancer has been to the therapy thus far. There are obviously gradients of the answer to be found from that test. The prognosis can change significantly based on that outcome. Later today, Tara is going for lunch with the women in her family - a long-standing tradition. I will take the girls late this afternoon to a soccer game in, of all places, Baltimore. This should constitute some enjoyable time to spend relaxing with them and some friends for both Tara and I today.